Wild Irish Seaweed is a great example of an Irish company combining a heritage product with modern-day business practices. Originally founded in 2009 by Gerard and Eileen Talty, the family business has grown from strength to strength – its food and health products can be found on sale nationwide, but it also has a presence in overseas markets. All four of Gerard and Eileen’s children are involved in the business, including Evan, a New Frontiers alumnus. 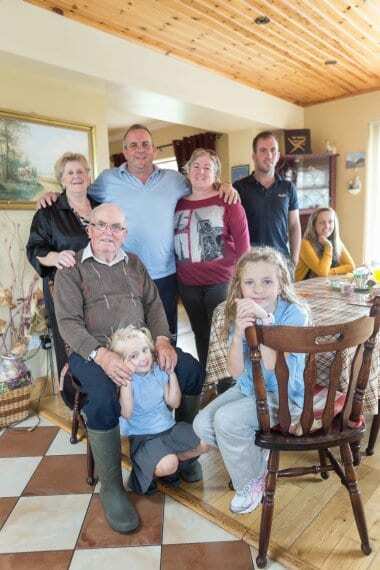 The first two products sold by the company – Dillisk and Carrageen – were prepared in the Talty family kitchen in County Clare. But as new products were added to the range, these facilities were soon outgrown, and the Taltys moved to bigger premises. One drawback, however, was that the seaweed could only be dried during the summer months. It became clear that if the business was going to continue to expand, a purpose-built facility would be needed. This expansion was very much a learning curve, as the seaweed industry was small in Ireland at the time, and a facility of the type that was required had never been built here. The new facility was a large but necessary expense for the business, representing an investment of about €150,000. But it is the nerve centre of the whole company – it’s also where the products are packed and stored and where the online shop is run from. Currently, Wild Irish Seaweed employs 15 people and that number is set to grow. In terms of brand awareness, Evan has adopted a modern approach that focuses on organic growth and content-based marketing. The company has a strong presence on social media – making use of Facebook, Twitter and Instagram to promote the business in different ways. Aside from working with social media marketing, Evan has also focussed on getting the company exposure by attending tradeshows and other events. They work closely with organisations such as Bord Bia in this area, joining delegations on overseas visits that could offer a strategic advantage. Expanding to these new markets poses completely new challenges. One of the biggest is how to get the product there in an affordable way. Evan has been looking to achieve this by cooperating with other Irish companies who already export to these regions – finding opportunities to piggy-back on those companies’ containers in a way that is financially beneficial to both parties. It’s a savvy approach, and when Evan joined the New Frontiers programme, becoming more business savvy was one of his main aims. Wild Irish Seaweed has prioritised sustainable growth and high-quality products, and it’s an approach that has clearly worked. Their online shop ships to around 25 countries worldwide, while their domestic supplier list is extensive and contains such well-known names as Centra and SuperValu. Evan’s sights are now firmly set on expansion into the US and China. Having started with the east coast of America, he hopes to roll out across the whole of the US by the end of the year, and he’s developing his plan to introduce Wild Irish Seaweed to the Chinese market. He sees the company becoming a global brand in the future and, if past success is anything to go by, he looks set to achieve this.